Arthritis is a disease which affects the joints. Archaeological evidence indicates that arthritis was known as far back as the earliest dynasties of ancient Egypt and possibly even earlier. In the new world, we found "prehistoric" North American Indian skeletal populations exhibiting arthritic deposits and bone deformities. The disease knows no boundaries as far as age, social status, or geographical distribution. The word arthritis is a general term used to refer to a several kinds of joint diseases but there are two main categories. These are osteoarthritis and rheumatoid arthritis. Symptoms can disappear, often following exercise, but usually reoccur later. It often appears in conjunction with physical or emotional stress. RA can affect a person of any age but is largely found in the 30-40 age range, and in women more often than men. Like osteoarthritis, rheumatoid arthritis destroys the cartilage in and around the joints, but rheumatoid arthritis can also destroy the bone surface. The body may replace the missing tissues with scar tissue which narrows the space between joints and can even fuse them. Master herbalist, Dr. John Christopher, said this of himself, "I came into this world bearing the unsavory burden of rheumatoid arthritis, a chronic form of the disease involving the destruction of the tissues of the joints, the cartilage of the joints, and even the bone surfaces themselves. Usually this disease comes upon a person after the age of thirty or forty, but the condition can be inherited. Some other symptoms include excruciating pain or swelling in the joints, debility, anemia, weight loss and fever. If there is extensive damage, the joints themselves can become fused together as the body deposits scar tissue in and around the joints. Rheumatoid arthritis often occurs and recurs during a person's life as it has done during mine. Physical stress or emotional stress can bring it on." Much of the article below is based on his research and experience. The other common type of arthritis, osteoarthritis, is generally found in older people. Osteoarthritis is caused by constant wear on or injury to the joint causing the cartilage, the white elastic substance attached to the bone surfaces in the joint, to thin and wear away. The function of this cartilage is to provide a smooth surface for the movement of the bones over each other at the joints. So eventually, as the surfaces of the bones in the joint become less and less cushioned, the joint bones rub together resulting in pain and stiffness. This can be extremely painful. Osteoarthritis generally affects the joints of the hips and knees, but can also affect other highly used joints such as the neck, low back, and fingers. The hips and knees are weight-bearing joints so being overweight can be a contributing factor in the condition. Stiffness and pain accompanied by inflammation is especially marked when there is cold and damp or humid weather, or in the morning, and after strenuous activity. Various allergies can cause inflammation leading to rheumatoid arthritis. Common related food allergies include: milk, beef, corn and wheat. Nightshade vegetables are a factor for increased inflammation for some people, including: tomatoes, potatoes, eggplant and pepper. Common environmental allergies include: dust, mold and pollen. Also reactions to various medications. A poorly functioning nervous and endocrine system can also be a factor in arthritis. The hypothalamus sends a signal to the parathyroid to begin dissolving bone if the body needs calcium elsewhere. The thyroid gland is the regulator of the reverse process. If the thyroid is underactive, bone may continue to dissolve, causing osteoporosis or bone loss. If it is overactive, excess calcium is deposited back into the bones. When the bones have enough calcium, the malfunctioning thyroid can't say "quit!" So, excess calcium may be deposited on the outside of the bones and even the joints. It would do well to check the thyroid (through iridology or otherwise) and use kelp or some form of organic iodine, to rebuild it if it is degenerating. Eating foods high in selenium, especially Brazil nuts (which is the main ingredient in our delicious Brazil Nut Wafers organic, raw snack) also provides an essential nutrient for thyroid health. Nutritional support is fundamental to maintain good health. Dr Christopher says, "There is an advertisement from the media that states "Arthritis STRIKES one person every so-and-so minutes, so give your money to us so we can research and find a cure." Actually arthritis does not Strike an individual. The groundwork for arthritis is laid by generations of man's transgression against the laws of nature." "Arthritis has been said to be "incurable." This is because most researchers have not looked into the fundamental reasons for the existence of a disease. We see in our society today, that arthritis is not just a disease that a few oldsters occasionally get, but that it has reached epidemic proportions among the population. The so-called incurable nature of diseases, arthritis, cancer, high blood pressure, heart disease, etc., are due to the long-term suppression of symptoms of these maladies by the extensive and indiscriminate use of allopathic (in most cases unwholesome and inorganic) drugs. The patient often has to take over/ under/or around-the-counter drugs for a lifetime in order to "manage" their disease while the natural body functions slow up and eventually shut down." "There is one basic cause for any disease and this is simply malnutrition. Poor food, poor digestion, poor assimilation, poor utilization, poor elimination. Add stress to this picture and you will see how a wonderful and complex mechanism designed by the Creator of the entire universe, made to function for 1,000 years, can be brutally destroyed by man's inventions: diseases." "One of the medical discoveries for the relief of arthritis, aspirin, was lauded as being the panacea of the century. But just a few years later, we found out the extensive damage that can be done to the stomach by this insipid poison. Mothers who have faithfully followed their doctor's orders and given their children aspirin for fever are now being told that this is a very dangerous practice and should be discontinued." "Drugs for arthritic pain have come and gone, each one being replaced by a new, uncertain experiment, possibly giving forth worse side effects than its predecessors. There is one thing about Mother Nature, folks, she is consistent. Nature's laws can be applied yesterday, today, and tomorrow. An apple or a fig was just as good for you in King Solomon's time as it is today-provided it isn't sprayed with DDT, thanks to our pals in the human race." It is important to remember, acids and calcium deposits around the joints can increase pain and swelling. Foods such a meat, sugar, grains and the chemicals of food processing create strong acid residues in the body after being metabolized which makes the body pull calcium from its proper place in the bones to put it into the bloodstream in order to buffer the acids created. On the other hand, many foods which are somewhat acidic before metabolism, such as lemons, oranges and apple cider vinegar, actually help dissolve food calcium to make it more available for use in the body. 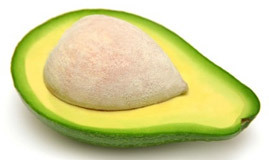 These foods which are acidic before eaten, leave an alkaline residue after metabolism. So when a small amount of acid foods that are well-metabolized are included in the diet, calcium can be utilized for building bone, not for buffering excess acids. Alkaline foods, such as leafy green vegetables, provide calcium and other minerals to calm inflammation, while a small amount of natural acids help utilize these minerals. Did you know that the vinegar in salad dressings helps dissolve calcium and other minerals for digestion, while the oil in salad dressing carries the fat-soluble minerals for better assimilation? Food chemistry for proper utilization of nutrients is not widely known anymore, but used to be part of the folk knowledge of our earlier cultures. "Calcium enters into solution in an acid medium. The apple cider vinegar creates an acidic medium which is capable of dissolving excess inorganic calcium--even if it is in the form of arthritic deposits in the joints. Cows, when allowed to graze by their own instincts, will always choose acidic vegetation over alkaline. When they are fed winter feed, they may run the risk of developing milk fever which affects the quality of their milk, often paralyzes their hind legs, and makes for difficult calf delivery. The acidity of the system determines the health of the newborn calf as well. Animals even take to drinking apple cider vinegar voluntarily when it is set before them." You can read more about alkaline/acids diets here We have a user-friendly quick reference Alkaline/Acid chart available here. Another way to help dissolve excess calcium in water is to put a squeeze of lemon juice into pure spring water - see our free eBook 5 Easy Ways to Get More Energy & Improve Digestion. "The consumption of meat adds uric acid wastes to the system, producing gouty inflammation. Processed "foods" with excessive carbohydrate intake also contribute to the malfunction of every cell in the body. It's always been a wonder how we, as a nation, spend so much time and monetary energy to find the proper animal feed when we don't even know what to feed ourselves." Focus diet on vegetables and fruits while reducing grains, dairy, meat, salt, sugar and processed foods - all acid-producing foods which cause the body to pull its calcium to buffer. Other Foods Garlic and onions can help with inflammation. Herbs such as cayenne and horseradish are also known to help with inflammation. 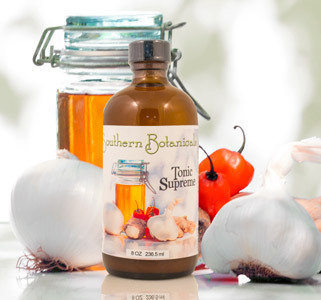 Our Tonic Supreme Concentrate contains all of these ingredients, helps with digestion and is an excellent alkalizer. In addition to this, we suggest changing to the mucusless diet described in "Dr. Christopher's Three Day Cleansing Program and Mucusless Diet", as well as the lower bowel tonic and other aids in our 10 Day Intestinal Cleanse. "Also juicing fresh fruit and vegetable juices for a time. Dr. Norman W. Walker's idea is that arthritis is caused by inorganic calcium deposits in the joints as a result of eating concentrated sugar and starch carbohydrates in excess. He suggests grapefruit juice, celery juice, carrot and spinach juice, and carrot and celery juice; a combination of carrot, beet, and cucumber are also recommended. "Consider blending or juicing carrot, celery, beets, parsley, spinach, cucumber and pineapple. Read more about his dietary suggestions in his book "The Vegetarian Guide to Diet & Salad." Vitamin C Several studies have been done on the connection between vitamin C and arthritis. Richard Lucas in his book, Nature's Medicines reports that in a hospital treating chronic diseases of the elderly, pain of arthritis was decreased within one month by the addition of 8 ounces of orange juice to the daily diet. Because many people eat meat, they have a build-up of uric acid in the system which tends to create these symptoms. In another study it was found that arthritis sufferers were relieved of gouty symptoms by drinking eating ½ lb of fresh cherries or drinking canned cherry juice daily. Many of our herbs contain Vitamin C. One of the highest is rose-hips. 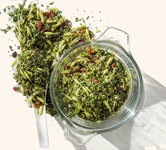 Rose hip tea is very refreshing and will certainly be an aid in eliminating uric acid build-up. Hibiscus flowers also contain high amounts of C. Any citrus fruits can also be aids. 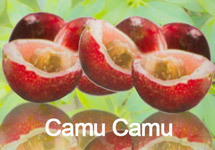 Camu Camu is a great source of Vitamin C. It is a fruit that comes from the rainforest of Peru and is among the highest plant sources of vitamin C in the world. We carry a great powdered Vitamin C made from Camu Camu. Silica Make sure to get adequate amounts of the trace mineral Silica because it is essential for proper calcium utilization, helping calcium to deposit into the bones. Food grade Diatomaceous Earth, is an excellent source of silica, containing about 86% silica and other trace minerals in smaller amounts. Glucosamine Sulfate and Chondroitin Sulfate: successful especially for knee pain. Reduces pain in general, increases function and can decrease joint space narrowing. Of the two, glucosamine sulfate is preferred due to more positive clinical successes. Use with caution in presence of diabetes. Sulfur: Pure Organic Sulfur Crystals (which is minimally processed MSM), can be an excellent nutrient to add to your supplement routine. Taken twice a day, dissolved in a bottle of water, sulfur, together with vitamin C, provides the building blocks for collagen and cartilage. It also helps to make cell walls more permeable, allowing oxygen and nutrients in, and wastes to pass out of swollen cells. For more information, you can read all about the health benefits of sulfur. Vitamin D: low vitamin D has been linked with "increased risk for osteoarthritis, increased joint space narrowing and increased osteophyte growth." We recommend getting out in the sunshine for 20 - 40 minutes of midday sun (11 am - 3 pm), three to six times a week, baring the skin over as much of the body as possible, for the best production of natural vitamin D.
Castor oil packs have been successful for drawing out inflammation. 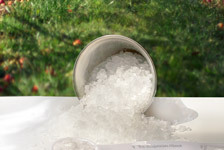 Massage, acupuncture and cell salts are also all great support for arthritic conditions. Analgesic herbs such as white willow bark and wintergreen have been successful in reducing pain due to inflammation. Some effective herbal aids for arthritis and rheumatism are hydrangea root (a great calcium solvent for any part of the body), Brigham herb (high in copper), yucca (with saponins that have a detergent-like action within the blood stream to cleanse and purify), chaparral (also high in copper), burdock root, sarsaparilla, wild lettuce, valerian, wormwood, cayenne, black cohosh, and black walnut. These herbs detoxify and dissolve old calcium deposits. Some of the herbs are very high in organic calcium, which can be used by the body. Choose exercises that strengthen muscles around joints. Do not overdo with strenuous exercise. Be sure to work on increasing flexibility; swimming and yoga are great choices. In conclusion, we add that the process of arthritis is a long one, to have the disease reach a chronic state, and relief (that is, complete relief) can only be a slow process of rebuilding the system. "Arthritis need not be the crippling scourge of mankind. If dietary discretion is applied early enough, arthritis can be prevented. In the later stages, it can be reversed if care is taken to apply the simple principles of nature, consistently and faithfully."